The incredible tales of adventurer Edward Bloom are coming to life in Big Fish, a mythical new musical about a man with big dreams and even bigger stories. Directed and choreographed by Susan Stroman, the show opens officially on October 6 at the Neil Simon Theatre. Read on to discover how Big Fish swam from the page to the big screen to the Broadway stage. Our story begins with two words, written on paper and tacked to author Daniel Wallace’s wall: Big Fish. “For years, I loved that title, but I had no story to go with it,” he told Broadway.com. After trying his hand at five books, none of which were published, Wallace and his wife had a son named Henry—and fatherhood inspired the tale that became his first published novel. “I wrote Big Fish in my laundry room while my son was napping,” Wallace said. “When you read the book, you can see how long he was asleep, like rings on a tree!” Although the novelist didn’t initially realize his book was semi-autobiographical, he now traces the story of Edward Bloom, a man who tells fantastical tales, back to his own dad. “My father was incredibly charming, and a great storyteller, but his jokes were much too dirty to appear in the book,” Wallace said with a laugh. As in Big Fish, Wallace had become estranged from his “charming and charismatic” father, E.D., a successful importer-exporter who disapproved of his son's desire to become a writer. In 1997, as Wallace was putting the finishing touches on his debut novel, he received a call from his father, who was about to undergo quadruple bypass surgery and passed away a few days later. Within months, Big Fish hit bookstores, and readers fell in love with the story of a man who tells a series of larger-than-life tales to his skeptical son. Meanwhile, John August, screenwriter of the hit film Charlie's Angels, faced a deadline: “I was sent the manuscript of Big Fish, which was about to be published, but no one had gotten the film rights,” he told Broadway.com. “I had 12 hours to read it and see if I wanted to throw my hat in the ring.” August was dazzled by the “small, intimate, giant, epic story,” and his mind was filled with cinematic imagery. “I could imagine how the story would be told as a movie,” he said. “There’s no circus in the book, but I thought a circus was a good way to stick a bunch of smaller stories together.” With the big screen as his canvas, August expanded Wallace’s original story, feeling a particular kinship to Will Bloom, the disenchanted son. “Working on Big Fish was a way to write about some of the things I experienced losing my own father a few years before,” he explained. 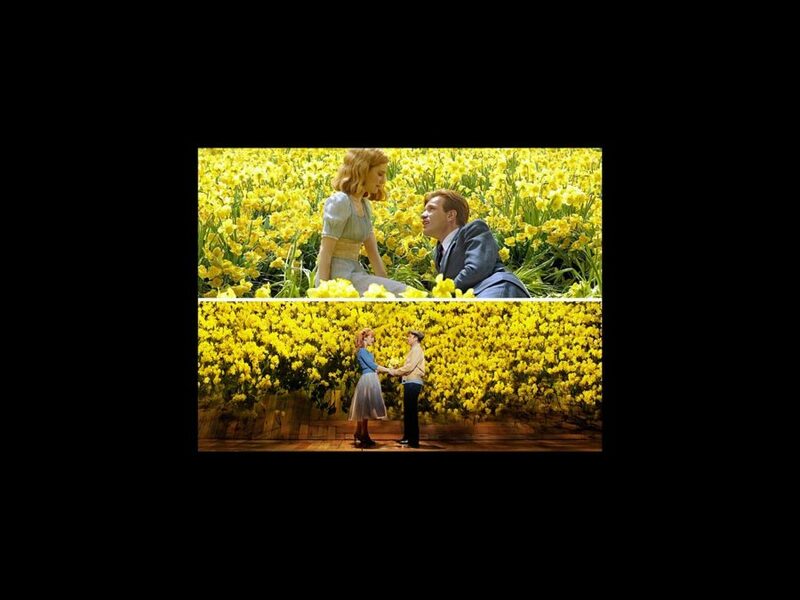 August's fantastical screenplay sparked the interest of Tim Burton, and with the Oscar-nominated director on board, Big Fish attracted Ewan McGregor as Ed Bloom and Albert Finney as Bloom in his golden years, as well as Jessica Lange, Billy Crudup, Marion Cotillard and Danny DeVito. With a $70 million budget, Big Fish hit theaters just before Christmas in 2003, drawing strong reviews and earning $122 million worldwide. Edward Bloom wasn't the only man with big dreams. Before the film’s release, August approached producers Dan Jinks and Bruce Cohen. “I told them, ‘I really think there’s a Broadway musical here,’” he recalled. Coincidentally, composer Andrew Lippa (The Addams Family, The Wild Party) had pitched the same idea to Jinks and Cohen. “Andrew flew out to Los Angeles and we barricaded ourselves in the house for four days,” said August. “We wrote two songs and two scenes, and that was the genesis.” Over the next nine years, the duo would continue to collaborate on Big Fish until they had created a new musical of epic proportions. Lippa and August were overjoyed to find a director who was as passionate about the story as they were: five-time Tony winner Susan Stroman. “I remember seeing the movie and crying at the end of it, and I don’t cry that much at movies—I’m a theater gal,” Stroman joked in a Big Fish promotional video. The challenge, the creative team agreed, was to find a man who could fill the enormous shoes of Edward Bloom, a character played by two actors in the film. Two-time Tony winner Norbert Leo Butz fit the bill. “Norbert is everything that Edward Bloom is,” Lippa said in a press video. “Norbert is funny; Norbert is charming; Norbert is a little roguish. We couldn’t be luckier.” With Butz on board, Big Fish premiered at Chicago’s Oriental Theatre on April 2, 2013, co-starring Kate Baldwin as Edward's beloved wife Sandra and Bobby Steggert as his level-headed son Will. The production got an encouraging response from Chicago critics, but the creators agreed that Big Fish could use some tweaking before casting its line into the Broadway sea. Over the summer of 2013, Lippa and August revised the first half-hour of Big Fish and added four new songs to bookend Edward Bloom's wild stories about joining the circus, kissing mermaids and fighting dragons. “Chicago was an amazing opportunity to see what it felt like in front of an audience, and we learned so much,” August explained. “The conflict between Edward and Will has sharpened. The Broadway production has really become a very different show.” The musical opens with Will, who is about to get married and have a child of his own, questioning his relationship with his charismatic father, whom he feels he's never really gotten the chance to know. Catch Big Fish, opening October 6 at the Neil Simon Theatre.